The widows of three Chilean soldiers have launched legal action against the country's Communist Party leader. The Communists' president, Guillermo Teillier admitted his party approved an armed operation targeting the late General Augusto Pinochet in 1986. Five troops escorting the leader died and 11 were injured in the ambush. Around 3,000 people disappeared or died in Chile between 1973 and 1990 and 30,000 are believed to have been tortured by the authorities. 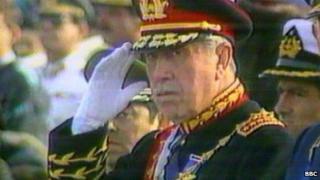 In an interview with the Chilean newspaper La Tercera in April, Mr Teillier said his party had approved the failed attempt against Gen Pinochet's life and other armed operations in the 1980s. It was "nothing more than a reaction" to what the government had been doing against the Communist leadership, Mr Teillier said. The women taking legal action say they want him jailed for the deaths. "We want justice and equality before the law, that's all we want," one of the widows told Chilean Radio Bio Bio. The recent 40th anniversary of the 1973 coup headed by Gen Pinochet re-ignited nationwide debate about responsibilities and punishment for crimes committed during the period of military rule. The daughters of an ally of the deposed leader Salvador Allende, former President Michelle Bachelet, and of a Pinochet assistant, Evelyn Matthei, are pitted against each other in next months presidential elections, which has heightened the country's political sensitivity further.